Motorola has confirmed it will be bringing Amazon Alexa to the Moto Z and other Motorola phones in 2017. Amazon and Motorola announced the project live at Mobile World Congress 2017 but didn't explain much about how the voice assistant technology would work inside your phone. Motorola did confirm you could use services such as Uber or Spotify, and you'll simply be able to talk to your phone when Alexa is around without touching the device. You’ll be able to say "Alexa" to activate it, much like you do on the Amazon Echo. Whether Motorola will be bringing Google Assistant – the voice assistant packed into Android 7 – to its upcoming smartphones is unclear. It’s also not clear what devices will be including the new Alexa technology, but Motorola did say it’s planning to include it in most of its lineup going forward. Whether the newly announced Moto G5 and Moto G5 Plus will include the technology remains unclear. 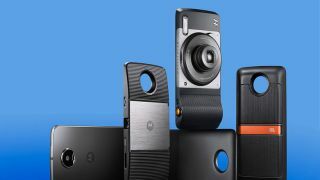 Motorola also announced a new Alexa mod for the Moto Z that allows you to use Amazon’s technology, but it’s not currently clear what benefit this would add over the newly announced tech baked into some of the phones.